Railroad executive; Businessman; Public servant. Having accumulated a substantial fortune by 1846, Forbes turned his considerable talents to railroad construction and financings. He was the prime mover in purchasing and completing the unfinished Michigan Central RR, and constructing the roads which formed the nucleus of the Chicago, Burlington & Quincy RR, of which he became president in the late 1870s. Always public-spirited citizen, Forbes made certain that the railroads in which he had an interest displayed a character and stability which significantly distinguished them from most of the other railroads of the day. His civic involvement began at the start of the Civil War, when he helped put the state of Massachusetts prepare for war, and he was instrumental in organizing the state's black regiments. In 1863, he was sent to England to block construction of, or to purchase, the so-called Laird rams that we being built there for the Confederacy. Throughout the war, his advice was constantly sought by all branches of government. A longtime member of the national executive committee of the Republican party, he broke with the party upon its nomination of James Blaine for the presidency in 1884. 1840, New York. Stock certificate issued to JOHN MURRAY FORBES (1813-1898) American railroad magnate, merchant, philanthropist and abolitionist. Forbes served as president of the Michigan Central and the Chicago Burlington and Quincy Railroads. Black / White. Vignettes of a steamship at top center and of a locomotive crossing a dam running vertically at left edge. Pen cancelled. Very Fine. 1888, New Jersey. 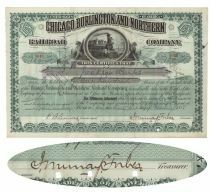 Stock certificate for 100 shares of the Chicago, Burlington and Northern RR Co. Green/Black. Attractive engraved steam locomotive vignette. 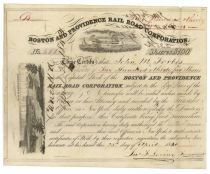 Signed as treasurer by JOHN MURRAY FORBES (1813 -1898); Railroad executive; Businessman; Public servant. Minor age toning along two vertical folds. Ink check mark at right margin. Fine. Punch and stamp cancellations not affecting Forbes' signature.